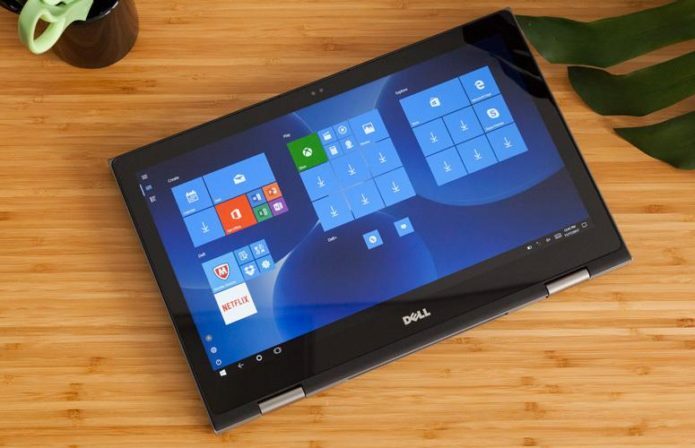 The Dell Inspiron 15 5000 2-in-1 combines a basic convertible design with Intel’s latest 8th-Generation processors, making it an attractive option with its starting price of $649 ($699 as reviewed). The specifications look promising for a midrange laptop, with a new processor, 256GB SSD, 1080p touch screen, and an infrared camera for easy and secure face logins. Unfortunately, the laptop suffers from a disappointing display, limited port selection and miserably short battery life. The sleek-looking 2-in-1 is made of dark-gray plastic with a metallic sheen, and features a bendback convertible design. Thanks to the laptop’s 360-degree hinge, you can flip and fold the Inspiron into four different modes: laptop, stand, tent and tablet mode. The hinges offer a good balance of firmness and easy movement so that you can transition from mode to mode smoothly, but feel stable in each. Dell touts the Inspiron 15 5000’s durability, citing extensive reliability testing. Dell boasts that the laptop can survive short periods of hot temperatures, up to 149 degrees Fahrenheit. The hinges are reportedly good for opening, closing and repositioning more than 20,000 times, while the keyboard keys are rated for more than 10 million keystrokes and the multimedia buttons for up to 40 thousand button presses. The battery can be removed and reinstalled 30+ times. The Inspiron 15 5000 2-in-1 measures 15.04 x 9.96 x 0.8 inches, which makes it similar in thickness and weight to other 2-in-1 systems, like the Lenovo Flex 5 (0.8 inches thick and 4.7 pounds), HP Envy x360 m6 (0.9 inches thick and 4.6 pounds) and Lenovo Yoga 720 (0.8 inches and 4.6 pounds). While this is a common weight for this size, the combination of bulk and heft makes the Inspiron a bit too large to comfortably use it as a tablet for long periods. On the left side of the laptop, you’ll find two USB 3.0 ports (one with PowerShare for charging phones and the like), an HDMI output and an audio jack. On the right is a USB 2.0 port, an SD card slot, and buttons for power and volume control. Conspicuously absent is a USB Type-C port, which can be found on both the Lenovo Flex 5 and the HP Envy x360 m6, while the Lenovo Yoga 720 steps up to a full Thunderbolt 3 port. The Inspiron 15 5000 comes with a crisp, 15.6-inch, 1080p display. When I watched the trailer for Rampage, Dwayne Johnson’s head had its familiar smooth sheen, and scenes of a 40-foot-tall gorilla destroying downtown Chicago looked gleefully chaotic. But explosions looked a bit dull, and the overall viewing experience was dim. According to our colorimeter, the Inspiron has better-than-average color accuracy, with a Delta-E score of 0.06 (closer to 0 is better). The next-best display we compared it against was the Lenovo Yoga 720 (4.2). Accuracy aside, the screen produces only 68 percent of the sRGB color gamut. While that’s similar to what we saw on the HP Envy x360 m6 (62), it’s mediocre compared to showings from the Lenovo Flex 5 (133) and Lenovo Yoga 720 (114). The screen’s brightness also left something to be desired, averaging 203 nits, which was again similar to the result from the HP Envy x360 m6 (200) but easily exceeded by the Lenovo Flex 5 (270) and the Lenovo Yoga 720 (272 nits). The touch screen tracked all of my tapping and gesturing without any issues. It supports 10-finger input and is compatible with Windows Ink and active-stylus devices. The laptop’s 15-inch chassis provides room for both a full qwerty keyboard and a number pad. The keyboard’s island-style, backlit keys have 1.1 millimeters of travel, which is a bit too shallow for comfort (we prefer between 1.5 and 2.0 mm). The shallow keys bottom out with every keystroke, making longer typing sessions uncomfortable. While I was able to reach 75 words per minute on the 10fastfingers.com typing test, nearly matching my usual 80 wpm, I wouldn’t want to use this as my primary keyboard. The touchpad is a generous 4.2 x 3.2 inches, with accurate tracking and good responsiveness to both individual taps and multitouch gestures. The right and left buttons are integrated into the touchpad surface, and the rounded edge of the keyboard deck makes it comfortable to use. The laptop is one of the first we’ve reviewed with an 8th-Generation Intel Core i5-8250U, a quad-core, 3.4GHz processor, paired with 8GB of RAMand a 256GB SSD. While using the system, I had 20 tabs open in Google Chrome, and streamed 1080p video from Netflix with no lag or slowing. The processor offers strong performance and scored 12,011 on the Geekbench 4 general-performance test. That surpasses even the performance seen on machines with the 7th-Generation Core i7 processors, like the Lenovo Flex 5 (7,177) and the HP Envy x360 m6 (8,322), which both utilize an Intel Core i7-7500U CPU and 16GB of RAM. The only score that came close was the 11,951 from the Lenovo Yoga 720 (Intel Core i7-7700HQ with 8GB RAM). The Inspiron 15 5000 2-in-1 took a brisk 3 minutes 41 seconds to finish our OpenOffice macro test, matching 20,000 names to addresses in a spreadsheet. That’s very similar to the times we saw from the Lenovo Yoga 720 (3:42) and the HP Envy x360 m6 (3:35), but almost a full minute faster than the Lenovo Flex 5’s showing (4:40). The Inspiron’s 256GB SSD took 27 seconds to copy a 4.97GB folder in our file-transfer test, for a rate of 188.5 MBps. That’s a lot quicker than you’ll see on a hard-drive-equipped system, like the HP Envy x360 m6 (50.89), but it lags behind results from the Lenovo Flex 5 (339 MBps) and Lenovo Yoga 720 (267.86). The Inspiron is outfitted with Intel’s integrated UHD 620 graphics solution, which played Dirt 3 at 31 frames per second, just a hair above the 30-fps playability threshold. That rate is better than the 22 fps offered by the HP Envy x360 m6, but compared to competitors with dedicated graphics cards, the Inspiron’s score is far from impressive. The Lenovo Flex 5 (70 fps) more than doubled that frame rate with its Nvidia GeForce 940MX, a nongaming GPU, while the Lenovo Yoga 720 (110 fps) blazed past them all with its Nvidia GeForce GTX 1050 gaming-class card. The Intel UHD 620 graphics also led the Inspiron to score 71,400 on 3DMark’s Ice Storm Unlimited test, a synthetic benchmark that measures graphics performance. That’s a few thousand points behind the HP Envy x360 m6 (74,705), but is trounced by scores from the Lenovo Flex 5 (100,242) and the more-premium Lenovo Yoga 720 (119,006). While I didn’t expect a midrange 15-inch laptop to wow me with all-day battery, the Dell Inspiron surprised me with just how brief the battery life was. The laptop lasted just 3 hours 44 minutes on the Laptop Battery Test, which involves continuous surfing over Wi-Fi. That’s nowhere close to times from competitors like the Lenovo Flex 5 (5:50) or HP Envy x360 m6 (6:15), and hours behind the all-day battery of the Lenovo Yoga 720 (8:59). The Dell’s built-in webcam isn’t that great, even for a 720p camera. While it captured details like the stripes on my sweater without any problem, the colors were just a bit off, and the whole image looked grainy. The Inspiron also includes an infrared (IR) camera for logging onto the computer with Windows Hello facial recognition. The Inspiron 15 5000 2-in-1 ran warm during our testing. After I streamed video for 15 minutes, the touchpad reached a reasonable 74 degrees, but the keyboard measured 97 degrees — higher than the 95-degree limit we consider to be within a comfortable range. The underside of the laptop stayed more reasonable, at 82 degrees, but we did see several hotspots edge up past the 100-degree mark. That’s enough of a problem on regular laptop, but on a 2-in-1 that doubles as a tablet, it’s too warm for comfortable handling. Running Windows 10 Home, the 15-inch Inspiron comes with a standard collection of preloaded software. Dell includes its own extras, like Power Manager Lite for battery settings and Help & Support for troubleshooting. The system comes with the usual Windows inclusions, like Bubble Witch Saga, Keeper password manager and Autodesk SketchBook. The system also comes with 30-day trials of Microsoft Office Suite and McAfee LiveSafe security. The Inspiron also includes 20GB of cloud storage (free for 12 months) with Dropbox, which is a nice bonus. Dell covers the Inspiron 15 5000 2-in-1 with a one-year warranty on parts and labor. See how Dell stacked up in our ranking of the Best and Worst Laptop Brands survey and Tech Support Showdown. The base model of the Inspiron 15 5000 2-in-1 sells for $649 and comes with the same Intel Core i5-8250U processor and 8GB of RAM seen in our review unit. The key difference is the 1TB hard drive for storage, which is more spacious, but will offer noticeably slower performance. Our $699 review unit was similar to the base model, but is equipped with a faster, 256GB solid-state drive. If you want to spend a fair amount more, you can upgrade to an Intel Core i7-8550U processor, with your choice of 1TB HDD or 512GB SSD ($749 and $899, respectively). All of these configurations can also be bundled with an active stylus for an additional $50. There are some positive points about the Dell Inspiron 15 5000 2-in-1, like a potent 8th-Generation Intel processor, an IR-camera for Windows Hello and a flexible 2-in-1 design. Unfortunately, the machine’s battery life is painfully short, the display is decidedly mediocre, and the keyboard didn’t do much to impress. If you’re attracted to the Dell’s affordable $699 price, consider the Lenovo Flex 5, which still offers decent performance but none of the drawbacks. If you have a bit more to spend, consider stepping up to a more-premium system like the Lenovo Yoga 720, which offers low-level gaming capability and a more refined design.